Stay safe. 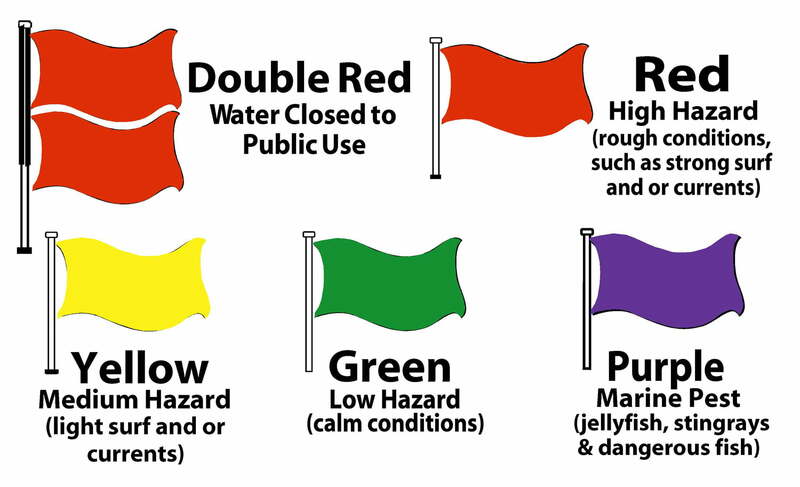 Know the Panama City Beach Warning Flags. When swimming in the Gulf of Mexico, safety should be your top priority. In Panama City Beach color-coded beach flags are in place to keep the public aware of sea conditions at all times. Remember, double red means stay out of the water – you could be arrested for ignoring this warning! So stay aware, and have fun on our gorgeous Florida beaches! Be aware that conditions in the Gulf of Mexico are constantly changing. Watch the flag colors at all times, and use good judgment to determine whether it’s safe to enter the water. The beach flags are there for your protection, so keep an eye on them! When going to Shell Island be aware that their are no Beach Warning Flags on the Island. Their are beach warning flags at the entrance of St Andrews State Park so be on the on lookout when you enter. However the water conditions can change rapidly during the day. When in doubt stay out of the water or come back to the boat and ask the captain what the flags are. Our number one goal at the Shell Island Shuttle is that you are safe.